Mckenzie Lacroix: Galaxy Note 7 Replacement Phones Catch Fire (As Well). Samsung Decides to Scrap Phone. Galaxy Note 7 Replacement Phones Catch Fire (As Well). Samsung Decides to Scrap Phone. Shortly before the public release of Apple's latest mobile phone rollout of the 7 and 7 Plus, Samsung released a much anticipated Note 7. At that time, I personally know a couple of iPhone owners that was actually considering ditching Apple for Samsung with the release of their new handset... until reports of Samsung's Note 7 spontaneously combusting began to take over the news. When the story first hit several weeks ago, I thought, "That's rather unfortunate." For both the consumer as well as Samsung, but definitely something the company can recover from. 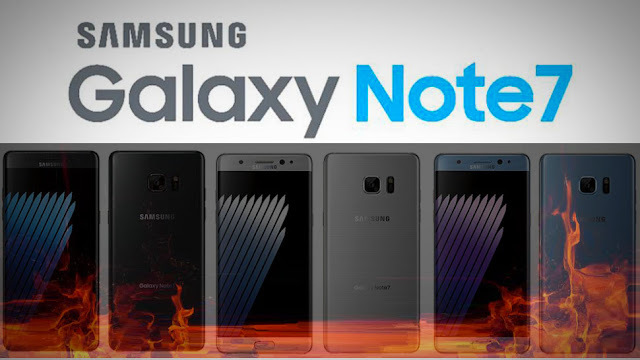 Unfortunately, it looks as though my latter thought holds little truth; as Samsung has decided to scrap the Note 7 completely following reports of replacement phones also catching fire. Immediately, what will those that had either already purchased or was thinking about purchasing the Samsung Note 7 do? I'm guessing that trust in the brand (in the cell phone arena) will plummet. As a result consumers (both loyal as well as new) will likely decide to seek the latest handsets elsewhere. Samsung Electronics Co. is ending production of its problematic Galaxy Note 7 smartphones, taking the drastic step of killing off a device that became a major headache for South Korea’s largest company. Samsung had already recalled the Note 7 once last month after early models exploded and the latest move comes after customers reported that replacement phones were also catching fire. Samsung will be without its highest-end smartphone that was supposed to compete against Apple Inc.’s iPhones and other premium devices during the holiday shopping season. “Samsung needs to act swiftly and move on to protect their brand image,” said Mark Newman, an analyst with Sanford C. Bernstein in Hong Kong. Samsung Electronics shares fell 8 percent in Seoul Tuesday, wiping out about $17 billion of market value, before the Note 7 termination was announced. The stock dropped further in London trading after the news, sliding as much as 9.9 percent. The company has not said how many new or replacement phones will be affected by the latest announcement. Analysts estimated the original recall would cost between $1 billion and $2 billion, but that figure will now certainly rise. Chung Chang Won, an analyst at Nomura Holdings Inc., estimated in a research note before the company’s announcement the worst-case scenario of Samsung terminating the Note 7 would cost the company about $5 billion in operating profit through 2017. Samsung had asked for a halt to Note 7 sales earlier on Tuesday under pressure from regulators and wireless operators that sell its phones. Consumers had reported problems with supposedly safe phones in the U.S. and China, and carriers such as AT&T Inc. and Australia’s Telstra Corp. halted sales. In one case, a Southwest Airlines Co. flight from Louisville, Kentucky, was evacuated because a replacement Note 7 began dispersing smoke and burned carpet flooring. The U.S. Consumer Product Safety Commission warned users not to use the Note 7 due to concerns over more incidents of overheating. The Korea Agency for Technology and Standards also asked Samsung to stop selling or exchanging the Note 7 after the regulator confirmed possible defects in the new phones. The Note 7 debuted to rave reviews in August, but the plaudits turned to criticism within weeks as phones exploded and images of charred handsets began appearing on social media. Samsung announced the first recall in Korea on Sept. 2, calling back the initial shipment of 2.5 million phones and then replacing them with what it said were safe devices. The flaw, it explained, was with the primary battery supplier, which a person familiar with the matter identified as affiliate Samsung SDI Co. All new phones would have batteries from another manufacturer.